The xE910 family is designed to optimize bandwidth and performance, while limiting the cost of transitioning from 2G to 4G. The compact and connector-less xE910 is cohesive family with a unified form factor. 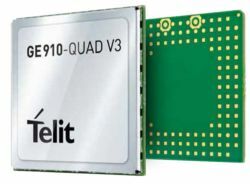 The xE910 family allows applications to be upgraded easily, through a variety of options, such as migrating from 2G to 3G or 4G or upgrading from 2 bands to 3, 4 or more. The family fully preserves the core design of the application or device from launch to phase-out with modules packaged in a common 28.2x28.2 mm LGA footprint.